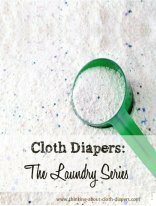 Wondering how to wash cloth diapers? If you ask around, you will probably discover that no two cloth-diapering mamas will follow the same laundry routine. Here are some basic instructions that you can modify depending on your washing machine type, diaper fabric, and detergent use. Note: Clean diapers should not smell. If your diapers are stinky after you have washed them, you may not be using enough detergent or enough water. If you have stinky diapers, learn more about urine residues here. I always recommend that you wash your diapers at least every three days, and preferably every two. If you wait more than 3 days, stains can become more stubborn, urine can weaken elastic and break down the material, and residues and smells can become harder to wash out. Below is a standard laundry routine for cloth diapers, but be sure to consider your cloth diaper manufacturer's washing instructions so you don't void your warranty! 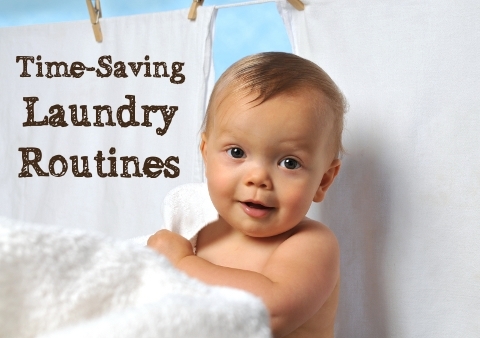 For more on how to wash cloth diapers, read our Laundry Tips for Cleaning Cloth Diapers. Set water levels to the highest settings (if you have this option), or select the cycle that adds the most water. In mine, this is "whitest whites" but it varies by machine. If you find your front-load washer is not adding enough water, you may need to add a wet towel to the load... front-load washers gauge how much water to add based on the weight of the load, and a wet towel will add extra weight! In my high-efficiency washer, I usually run a delicate cold cycle with no detergent (which uses more water) instead of the cold water rinse, to make sure the detergent is all rinsed out. Adjust the dosage of detergent based on the detergent label recommendation. Many brands suggest about 1/2 of the amount you would use in a front-loading machine if you have an HE washer. Follow the detergent manufacturer's dosage recommendation. While less energy efficient than front-loaders, top-loaders are a great option for cloth diapers, since is much easier to manage the water settings in top-load machines. Use the maximum water setting and maximum agitation. 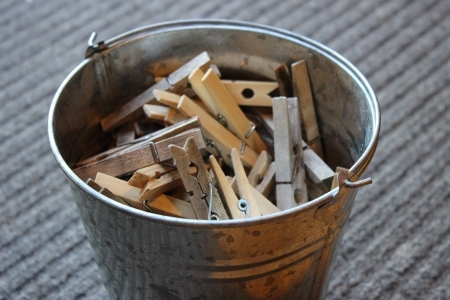 When might I need to change my laundry routine? 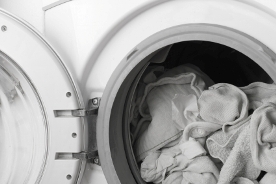 Did you know that hard water can have a major impact on your cloth diaper laundry routine? 85% of North American households are affected by hard water, and not every cloth diaper detergent is designed to work well with hard water. If you’ve run into (or would like to avoid!) problems, this article on cleaning cloth diapers in hard water conditions will help you find out how choosing the right detergent, changing the amount you use, or adding a water conditioner can simplify your cloth diaper experience by eliminating or reducing stripping from your laundry routines, and extend the life of your diapers, too! This is one of our most-popular articles, and it's a great place to start reading. What kind of laundry detergent should I use? Almost any detergent can work for cloth diapers. If what you are using is working, there's no reason to change it! Our favorite cloth diaper detergent is Nellie's Laundry Soda. Please check out our article on cloth diaper detergents for more information on how to select a detergent that will work for you!